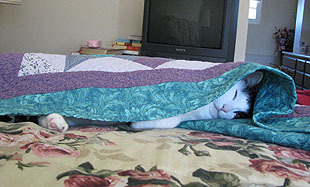 For some reason, Inkblot has spent the past week burrowing under the quilt on our bed for his afternoon snooze. During cold weather this is pretty normal, but it’s been anything but cold around here lately. It’s 70 degrees right now, and has been all week. So what’s up? 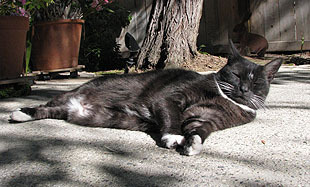 Domino, as you can see, has the right idea, lolling about in the sunshine before she repairs to the chaise longue for a nap. She’s a Southern California cat and never forgets it.